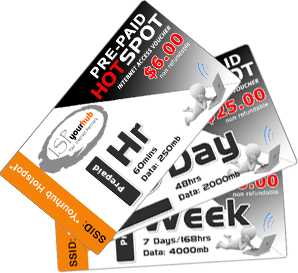 Yourhub.com.au - WiFi Hotspots, Wireless Internet Hotspots Townsville, Cairns, Mackay. LOOK FOR SSID: "A YOURHUB HOTSPOT (Location)"
on your laptop, PDA or mobile device. Connect to Yourhub's Wireless Hotspots with your mobile and fixed devices (Laptops, Mobile Phones, IPhone,IPad's and other wireless devices). Ideal for short term or long term users. Prepay for your time in hourly, daily, weekly and monthly blocks and use it as you please. Monthly plans available with no contract or setup fees. Simply connect to the SSID "A Yourhub Hotspot (Location)". Choose your desired prepaid package and start browsing. You can even recharge an existing account online or by purchasing a prepaid voucher from any of the Yourhub Hotspot locations. Want to offer a Yourhub Hotspot from your business? Click on advertisement below for more partner details.